The Car Sun Shade for Side and Rear Window (4 Pack) is on sale for $10.10 at Amazon right now. That's 49% off the list price of $19.99! 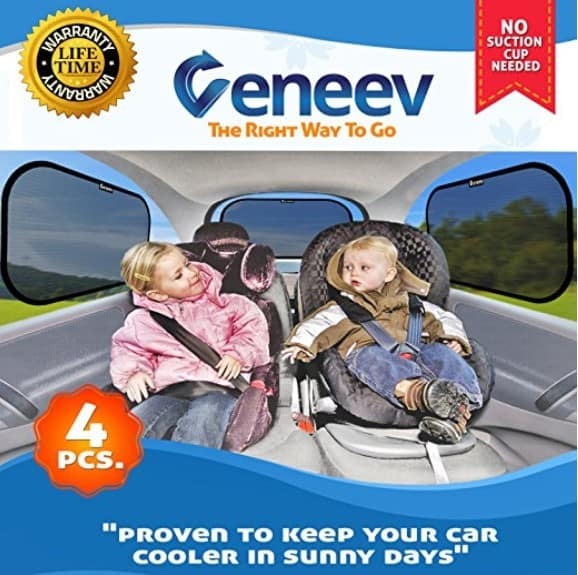 PROTECT YOUR CHILDREN FROM UP TO 98% OF UV SUN RAYS – Our package, which includes two 20 x 12 side car window sun shades, two 17 x 19 large window or rear window sun shades, dashboard mat, and storage pouch, will safeguard your children from exposure to as much as 98% of harmful UV rays. EZ CLING SUNSHADES – Whenever you’re ready, just pop these sun shades out of their convenient storage pouch and press against the window glass to adhere. PUT IN PLACE QUICKLY AND EASILY – The fact that our sun shades go on quickly and easily means you do not need to fumble with awkward or bulky cardboard panels. Our “twist to fold” design makes it convenient to fold and unfold these shades, and allows them to be neatly tucked away inside your car organizer when not in use. PROMOTE SAFETY FIRST AND FOREMOST – Using our side and rear window shades will protect your child from glare and heat. Not only that, but we have put extensive research into our product to ensure it exceeds even the highest industry standards. PROTECT CHILDREN AND PETS DURING LONG CAR RIDES – Our sun shades provide SPF 30+ protection, and will keep your kids (even your four-legged ones) cool and comfortable no matter how far you are traveling. With our lifetime money back guarantee, it just makes good sense to have a set on hand before you head out on vacation.